Home / Reviews / Household / Got Vicks Dayquil, Got Nyquil, We are Ready! Got Vicks Dayquil, Got Nyquil, We are Ready! This conversation is sponsored by SheSpeaks and P&G. The opinions in this post are 100% mine. Have you ever had one of those colds or even the flu where no matter what you do, it just will not stop. You try to sleep, and you can’t get comfortable, and when you do finally get comfortable your nose is running and you have to get a tissue. Then you do get to sleep and you wake up coughing and hacking away? I had that cold this year and every single one of us in our family had it too! We were all miserable and of course we cannot just tell a toddler and an infant that we can’t deal with them today, they need us to be awake and ready to care for them even if we are sick. It feels like everyone in Southern California has this cold or the flu! 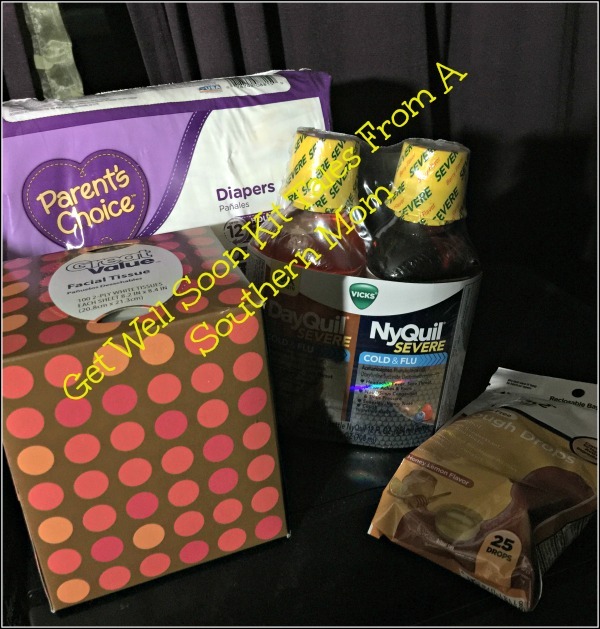 Well, this cold almost had us beat but, we were lucky this year and Vicks sent us a gift card to our local Wal Mart to buy their new SEVERE cold and flu Dayqul and Nyquil! I was so relieved to have something that I knew would work! We got over to Walmart, bought tissues, some throat drops, a frozen lasagna, chicken soup, lots of bottled water and of course our Dayquil and Nyquil Severe Cold Formulas. It was a relief that I only had to go to one store that had it all, even picked up some disposable diapers while we were there, who wants to wash cloth diapers while sick? We always get the liquid, something about the medicine going down makes it feel better faster, they do have capsules available if you need something portable. 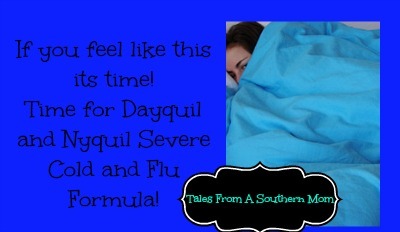 Everyone in the house that was old enough took the Dayquil and a couple of us needed to the Nyquil as well. What a great product to have in your medicine cabinet when you need it, we used the whole bottle of both of them during our illness and I actually purchased another set the last time I went to Walmart so we don’t have to go out sick next time. 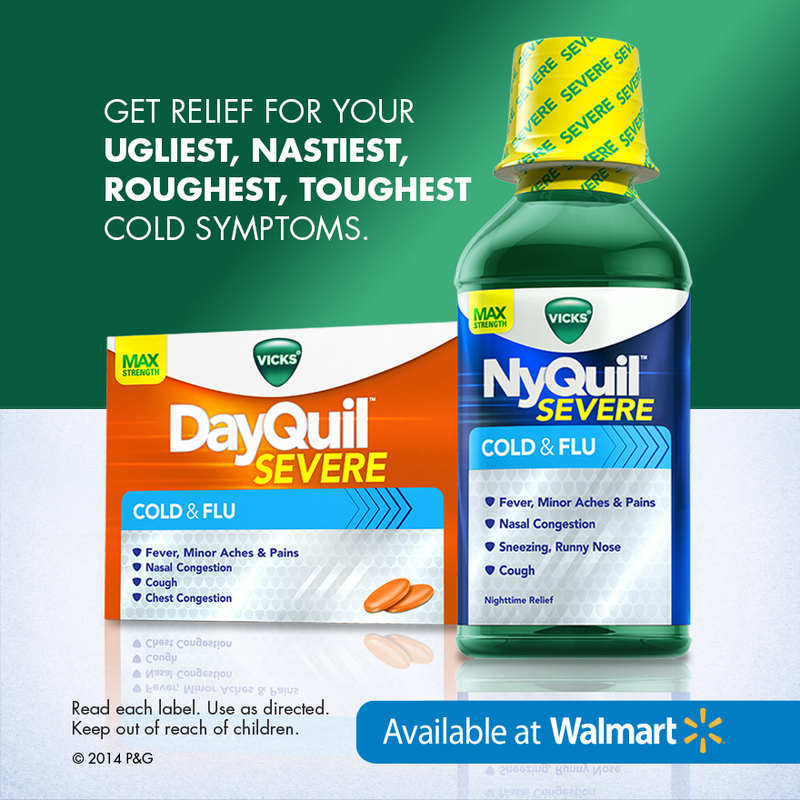 If you have the flu, or the bad cold that is going around this year, I strongly suggest you try the Dual Pack of Dayquil and Nyquil. It will take care of all of this! Even if you have not gotten it yet this year chances are you just might, so it is time to pick some up at your local Walmart and have it at the ready to help you and your family get through this rough season! Previous post: Best Accessories for Soniclear Facial Brush and Bonus Savings! I love your get well kit, I need on myself. Nyquil is so great when you just want to feel better right away. I’ve been lucky to have dodged cold and flu this year. Nyquil is such an effective remedy, and I remember in high school days when it would help me go to sleep when I sick. They didn’t have daytime and nighttime options then. I don’t normally use medicine for a cold but the cold that I got this year was nasty. I really should buy some Nyquil and keep it at home. I bet it would have really helped me when I was sick. I haven’t heard it before but looks really nice brand. I used vicks sometimes but thanks for this. I always take some of the pill form on trips with me. It never fails that we get sick when we travel. Love these products! We have had the flu over here for the past three weeks. It is so scary and I have to say that Vicks has been helping everyone to sleep through the night. Hubby is relying on it for relief. Ahhhh dayquil is literally my go to medicine when sick! I swear its a miracle worker most of the time!!! I’ve never seen these particular products here in Ireland. Such a shame because my family and I could really do with them right now, we’ve had the flu for weeks now! You are seasonally on par with this one! We just stocked up on Day and Night bottles for our family. I love all the “quils”. I use Dayquil when I feel junky during the day, and I use Nyquil at night. That stuff really works. That’s good for me, because I’m self employed. I don’t have time to be sick! This is such a cute idea. A get well kit is the perfect thing to give someone who’s feeling dumpy with the creeping crud. The one and only time I took Nyquil I had a really weird effect on me…it was actually kind of funny! I actually prefer more natural medicines when I actually do take them, lol! I have been using both of these products for years. They both really work, so I keep using them. Pefect timing! My husband is sick and now I know just what to buy. Thank you for a great post! I love your got well soon kit. Such a cute idea!